Michael Maciag scored the winning goal at 2:56 of double overtime to lift the Coquitlam Express to a 3-2 overtime victory over the Surrey Eagles in the last game of the regular season for both teams. Despite the loss, Surrey clinched the Ron Boileau Memorial Trophy with the single point. It's the second time the Eagles have finished atop the league's regular season standings, and the first time they've done it in 16 years. The Birds opened the scoring early in the first period for the second night in a row. Kevan Kilistoff tallied his seventh goal of the year when he chipped the puck past Cole Huggins to give the home team the lead. Surrey maintained the advantage throughout the first period and took the 1-0 lead to the dressing room after 20 minutes of play. In the second, Coquitlam pulled even when Mitch Fyffe scored on Michael Santaguida at 7:01, but the Eagles retook the lead with a power play goal late in the period as Michael Stenerson deflected Adam Tambellini's point shot past Huggins to make it 2-1. Stenerson is red hot heading into the post season. The Surrey native has a goal in his last five games in a row. The Express pressured the Birds in the third, searching for an equalizer, and they found it just after the midway mark of the period when former Eagle Brandon Morley tied the game with a great individual effort as he forced a turnover deep in the Surrey zone, intercepting a pass on the fore check, before walking out front and beating Santaguida with a backhander. Neither team was able to find a go ahead goal in the third, and the game went to OT. The two teams traded chances in the first overtime period, and Coquitlam had a great chance to end the game when Dan O'Keefe was called for tripping, giving the Express a power play. But the Surrey penalty kill was equal to the task, forcing the game into double overtime. Maciag scored the winner on a 2-on-1 after Morley made a great pass off the left wing to find him going hard to the net, and the Coquitlam defenseman just had to direct the puck into the net. Surrey was 1-for-4 on the man advantage while Coquitlam was 0-for-4. The Express out shot the Eagles 40-36. Up next for Surrey, it's the playoffs! 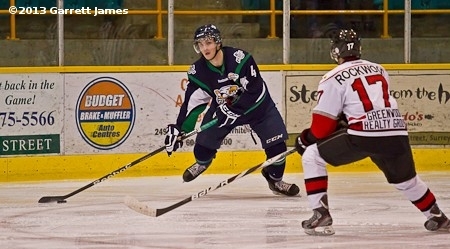 The Eagles open the first round against the Langley Rivermen on Friday evening. Be at the rink at 7:00pm to help the Birds defend the nest. For tickets, call 604-531-GOAL (4625).